This colored lithograph is a bird's eye view of Neosho Falls, Kansas. 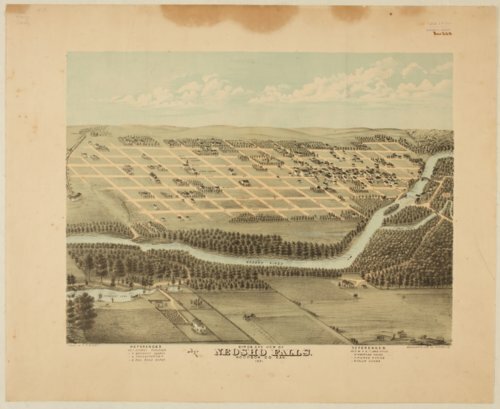 The county court house, churches, a school, a railroad depot and land office for the Missouri, Kansas, and Texas Railroad, and several hotels have been identified in the bottom reference area. The Neosho River runs through the community. The Crescent Lake is in the lower left corner. The image was drawn by E. S. Glover and published by the Merchants Litho Company, Chicago, Illinois.